The large undecorated high cross at Fore, stands in the graveyard to the east of St Féichins pre-norman church. The original 7th century monastery was probably established on this site by St Féichin. Nothing remains from the early foundation. The sandstone cross along with the church are pre-norman. It stands 1.20 metres high and measures almost one metre across the arms. The head, which has a pierced ring, was broken into four pieces and the 22cm shaft was broken in several places. The re-constructed cross stands in what I presume is it's original square base. 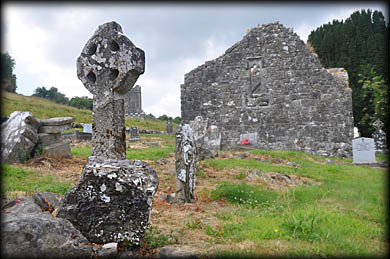 A large number of these early stone crosses can be found around Ireland. They have quite a varied size and style, some feature rings, some pierced and some unpierced, others bear simple decoration and some are just plain. The cross at Aghowle in Wicklow has an unpierced ring and the one at Nurney, in Carlow, bears a boss at the centre of the ring. 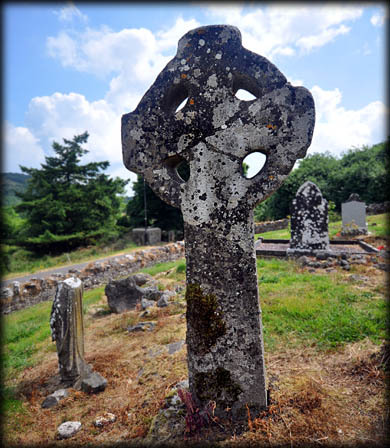 An early plain cross stands in the graveyard at Adamstown, County Wexford. Situated: From Castlepollard, County Westmeath take the R195 east, then take the third right. The cross is in the graveyard at St Féichin's Church, one kilometre down this road on your right. Discovery Map 41: N 5099 7046. Last visit July 2018.